If it's your first time with Zaluum, please start with the Hello World tutorial instead. PREVIEW The runtime library is not defined yet, some names may change in the 1.0 version. This tutorial is centered in the techniques needed to create new boxes and mix Java and Zaluum. The classes created are for educational purposes only, they are not optimized nor are feature complete. The Zaluum standard library aims to provide some of the functionality presented here in a ready-to-use form. Please share your thoughts on how the standard library should be. We will create a simple application to play and visualize sound waveforms. The techniques described can be applied to other real time data situations. Create a Zaluum project, like explained in the HelloWorld tutorial. Select all the following code and copy it to the clipboard. Don't worry, the line numbers don't get copied. Go to Eclipse, select the src folder and paste it with Ctrl-V. A new Java file will be created in the correct package folder. // We use the @Box annotation to make this class show up in the palette. // A helper buffer to read the 4 bytes of the frame. One short for each channel. // We will read chunks of 1024 samples. // We read the data a frame at a time in an endless loop. 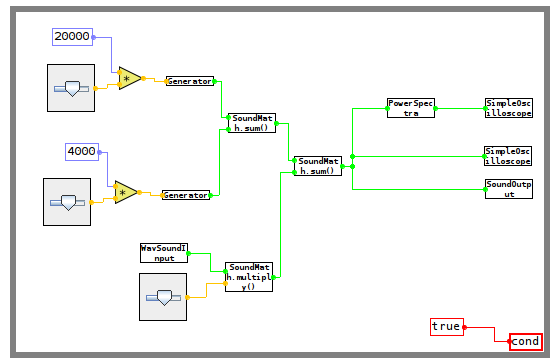 // The output data is the first channel scaled to 0 to 1. 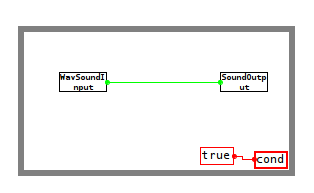 Java provides a basic sound API that allows us to load and play sounds in almost any machine. The precise hardware and format support depends on the vendor and version of your JVM. Usual JVMs, such as Oracle's or OpenJDK can provide 16 bit PCM 44100Hz sound output, and read WAV files. This class creates a simple box that reads a WAV file and give us the values of the waveform in chunks. The purpose of this example is to show the flexibility that provides the Java interop. That's all it's needed to create a useful box. As you can see, it's a plain Java class. The only clues that indicate that it's used as a box, are the @Box and @Apply annotations. These annotations are only present to put an entry in the palette. 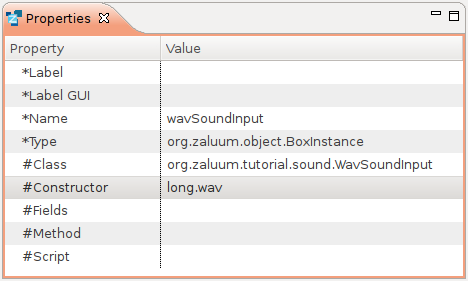 You could perfectly skip the annotations and create a Box Instance with #Class: org.zaluum.tutorial.sound.WavSoundInput and #Method: chunk|0 to achieve the same result. Again it is a plain java class with some annotations. The write method blocks until the sound buffer is free. It's a While box with a Literal true attached to the continue condition. Inside there is an instance of WavSoundInput and another of SoundOutput drag and dropped from the palette. Download long.wav and copy it to the root folder of your project (not the src folder). The WavSoundInput needs a constructor parameter. If you try to save the file now, you will see the error show up telling you that the constructor hasn't been found. You can double-click the error to go to the source of the error. With the WavSoundInput box selected, go to the field #Constructor in the Properties view, select the constructor and type long.wav as the file name. To demonstrate how to create a visual widget with Zaluum, we will build a very simple oscilloscope view that paints arrays of doubles. All the Zaluum widgets are Swing classes, so any class extending java.awt.Component can be used visually. The creation of new widgets from plain Swing is intended for power users and it is not a required skill for the typical user of Zaluum. // Mark it as volatile since it will be accessed by different threads. repaint(); // ask Swing to repaint when she can. // This paint method will be executed in the Swing thread. double hold = data; // We "sample-and-hold" the data to avoid locking. We have to take into account the usual threading issues of Swing applications. The GUI widgets will be executed in a Swing thread, and the main program in some other. In this case, when data arrives, to the apply method we simply store the array reference to be painted to a volatile and ask for a repaint. The volatile keyword ensures that any other thread will see the last value stored. We could have solved with synchronized , locks or atomic references. The point is that the data comming from apply has to be properly handed to the Swing thread. There is plenty of literature available covering how to write thread-safe Swing components that you can immediately apply to Zaluum. The repaint call posts a request to the Swing thread to execute the paint routines. When Swing sees fit, it will call paint and eventually the overriden paintComponent . The paintComponent method stores a local reference to data so the field can continue to be updated from the other thread without locking for the entire duration of the paint operation. For painting we scale the x axis to the pixels available and paint a line between every consecutive point. We also want to implement a couple of features for demonstration purposes: we should be able to select if the 0 of the y axis is centered vertically or it is on the top of the screen, and we want to choose the amount of zoom we want in the y axis. They could be passed as parameters in the apply method, or in another apply method with parameters data, yzoom and ycenter but we will implement them as JavaBeans, so they are shown as properties of the box. We have a couple of getters and setters following the JavaBeans conventions that update the properties centery and yzoom. Any JavaBean property of the class will be shown in the properties view (any property with a type supported by the editor: primitives, strings, colors, dimensions...). This property will be set at runtime just after the object is created. It is a good way for the user to control the behaviour and presentation of widgets. The lesson should be that you don't need much to create or reuse widgets in Zaluum. Now let's test it. 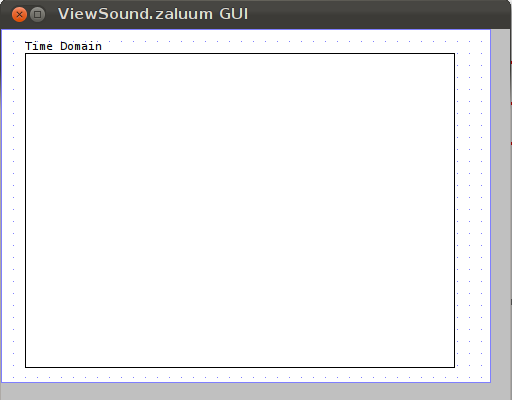 Duplicate the PlaySound.zaluum copy - pasting the file and store it as ViewSound.zaluum. Drag and drop a SimpleOscilloscope from the palette (or use the right button), and drop it inside the While box, next to the SoundOutput you already have. 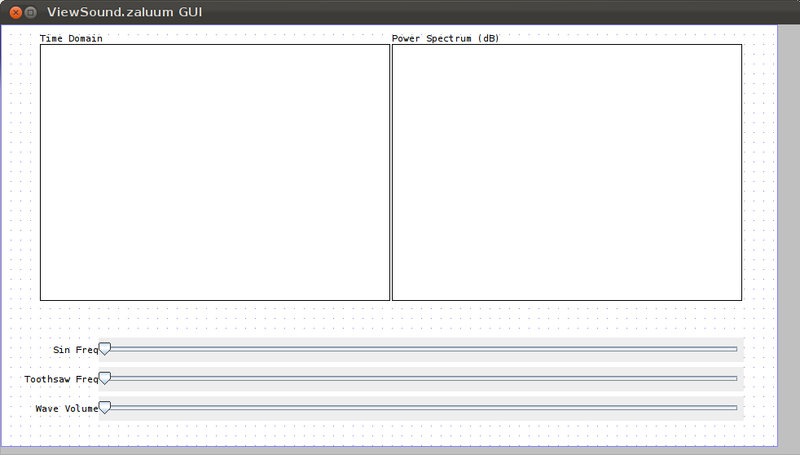 Now switch to the GUI view with F6 or the GUI button in the toolbar. The widget may be out of the view, expand or scroll the window until you find a little square. That's our oscilloscope. 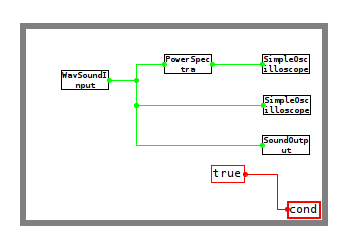 If you have trouble finding it, click on the SimpleOscilloscope in the diagram view while keeping the GUI view open and it will flash briefly. Select the square in the GUI view, move it to the top left and resize it to a suitable size. Make sure you resize the canvas (the white background with dots) to match the size of the widget. The sound data is scaled from -1 to 1 so we need to zoom it at least by 100 to see it. Write 100 in the zoomy property. For fun, try to change the background color of the JComponent! Execute with with Right click→Run As...→Zaluum Application and watch your wave. Apart from simply viewing the wave we could apply some maths to it to see a few more things. We will be applying a Fast Fourier Transform to see our sounds in the frequency domain. This section demostrates how to use external libraries. Add this code to the project. We need some helper functions to help us operate with arrays. In this preview the boxes to operate with arrays visually are not ready yet. When they are done, we will be able to get rid of this Java if we want. double scaled = abs / result.length; // not counting the window. The code is quite straightforward. We mark the class as @StaticBox so it's code get's scanned by the palette and mark as @Box the methods we want to show. We have code to multiply and sum arrays, Hamming window function and some code to extract the power spectral density of the FFT's results. The Hamming window is used to "smooth" the edges of the data feeded to the FFT to minimize some artifacts with non-periodic signals. The power spectrum is a way to paint the results of the FFT in a logarithmic format. Download jtransforms-2.4.jar (source page) and save it in your project's root directory. Then add it to the classpath: Right click the jar and go to Build Path→Add to Build Path. JTransforms is a good open source implementation of the FFT for Java made by Piotr Wendykier. We are simply creating a FFT instance for doubles of our chunk size. The apply method puts the data in an array capable of holding the real/imaginary values interleaved, and copies the result back into an array of the proper size. The signal and power are ports. Create an input port from the palette <ports>, double click it to rename it to signal. Do the same with power but as an output port. The hamming window is precalculated in a static field for demonstration purposes. To access a static field, drop a FieldStatic box from org.zaluum.object. Put org.zaluum.tutorial.sound.SoundMath in the #Class property and hamming into #Field. The left connection updates the field if connected and the right one takes its value. Place the new Oscilloscope in the GUI view and set the ycenter property to false , to have the 0dB at the top of the plot and the yzoom to 10 . We have a box Generator with two apply methods with the same signature. Since they are not distinguishible we will need to make explicit which one to call. 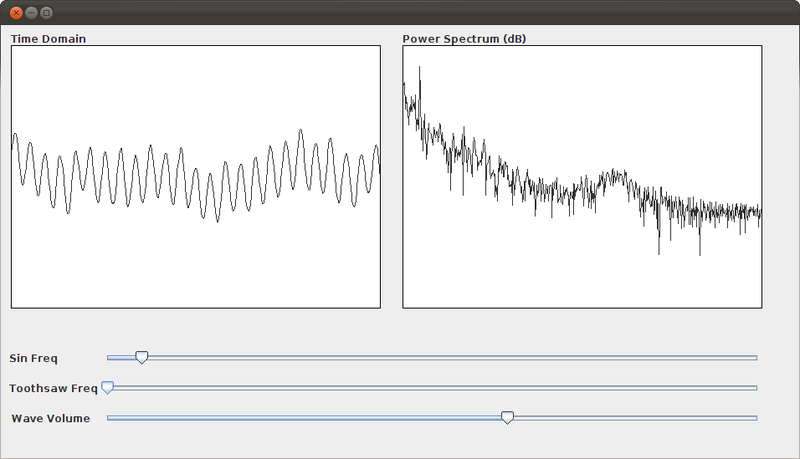 One generates a sine wave and the other a toothsaw signal with frequency in Hz passed as a parameter. Run it, and see the different effects of mixing a sine wave and a triangular wave.